The usual method of detecting this insect is by observing masses of pitch (pitch tubes) on the bark of dying pine trees. Adult beetles are tiny, being 1/16 to 3/16 inch long, dark brown to black cylindrical beetles. Diagnosis of dead trees is made by the appearance of the pattern of galleries that appears S-shaped underneath the bark and outside of the heartwood (in the phloem-cambium layer). Other bark beetles that attack pine trees include the black turpentine beetle, Dendroctonus terebrans (Oliv. ), and engraver beetles (Ips species). 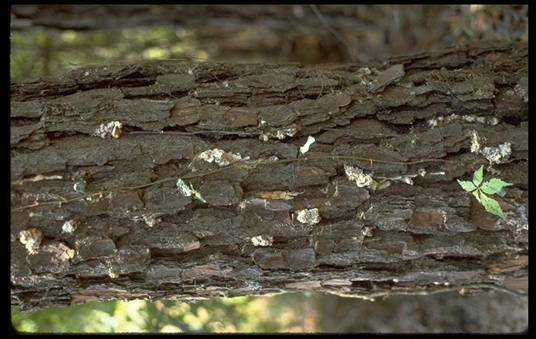 These beetles produce superficially similar symptoms to those caused by southern pine beetles on the trunk, but may not result in rapid decline and death of infested trees. The gallery patterns of these beetles are not S-shaped patterns. Getting a beetle infestation under control is imperative in a southeast Texas neighborhood where Pines are the predominant tree. *Above information was taken from the TAMU website.